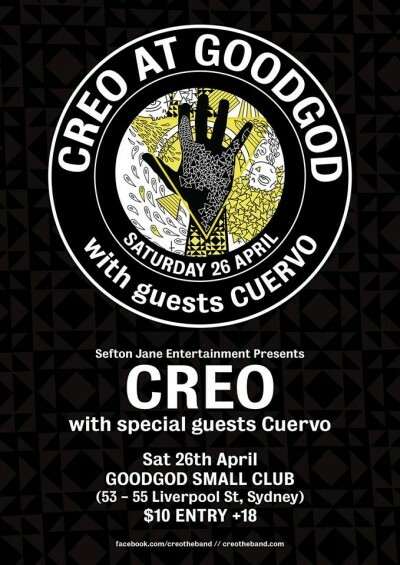 Last time CREO took to the Goodgod stage, it was a sweaty, loud, rawkus night. Memories were made, strings were broken. Strangers entered, stood inappropriately close to one another, sang in unison and left as friends. A good time was had by all. After a busy 2013 touring their debut EP the Memo, CREO have announced they’re returning to Goodgod for an intimate one off Sydney date to showcase their new material for their upcoming release due mid 2014. They’re joined by Cuervo for a killer early gig. Make sure you’re in bright n’ early for this one!